<h2>Earth’s magnetic poles could start to flip. What happens then?</h2><br /><p>This is a possibility that we may start to face not in the next million years, not in the next thousand, but in the next hundred. If Earth’s magnetic field were to decay significantly, it could collapse altogether and flip polarity – changing magnetic north to south and vice versa. The consequences of this process could be dire for our planet.</p> <p>Most worryingly, we may be headed right for this scenario.</p> <p>‘The geomagnetic field has been decaying for the last 3,000 years,’ said Dr Nicolas Thouveny from the European Centre for Research and Teaching of Environmental Geosciences (CEREGE) in Aix-en-Provence, France. ‘If it continues to fall down at this rate, in less than one millennium we will be in a critical (period).’</p> <p>Dr Thouveny is one of the principal investigators on the five-year <a href="https://cordis.europa.eu/result/rcn/195450_en.html" target="_blank" rel="noopener noreferrer">EDIFICE</a> project, which has been running since 2014. Together with his colleagues, he has been investigating the history of Earth’s magnetic field, including when it has reversed in the past, and when it might again.</p> <p><strong>Cosmic rays</strong></p> <p>Our planet’s magnetic field is predominantly created by the flow of liquid iron inside the core. It has always been a feature of our planet, but it has flipped in polarity repeatedly throughout Earth’s history. 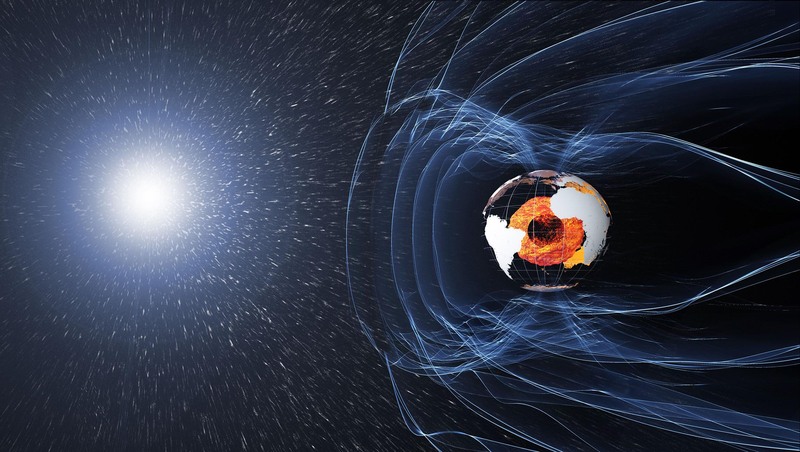 Each time it flips – up to 100 times in the past 20 million years, while the reversal can take about 1,000 years to complete – it leaves <a href="https://theconversation.com/the-earths-magnetic-field-reverses-more-often-now-we-know-why-96957" target="_blank" rel="noopener noreferrer">fossilised magnetisation</a> in rocks on Earth.</p> <p>By taking cores - or columns - of sediments from the sea floor, like a long straw that can extend down up to 300 metres with the help of a drill, we can look back in time and see when these reversals occurred. Dr Thouveny and his team looked at two particular forms of elements that allowed them to probe the history of our planet’s magnetic field in greater detail.</p> <p>For a polarity reversal to occur, the magnetic field needs to weaken by about 90% to a threshold level. 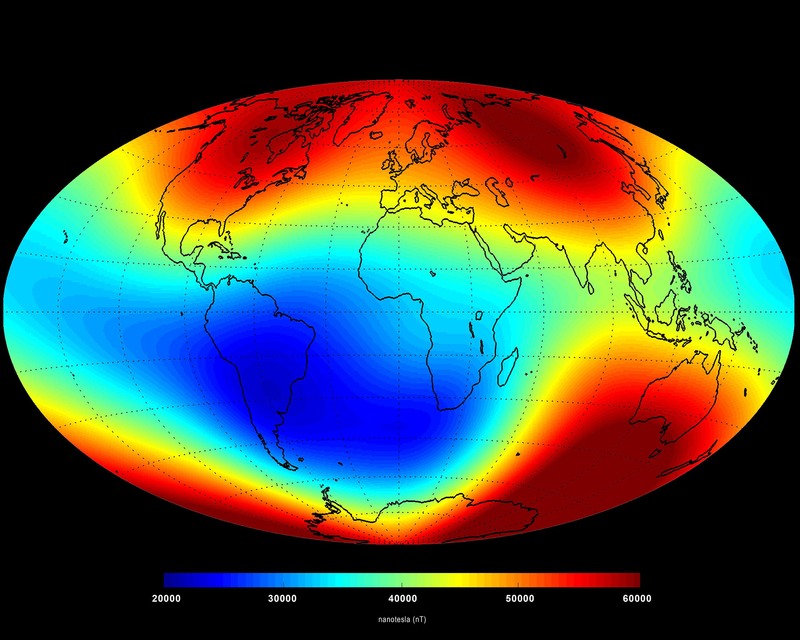 This process can take thousands of years, and during this time, the lack of a protective magnetic shield around our planet allows more cosmic rays – high-energy particles from elsewhere in the universe – to hit us.</p> <p>When this happens, these cosmic rays collide with more and more atoms in our atmosphere, such as nitrogen and oxygen. This produces variants of elements called cosmogenic isotopes, such as carbon-14 and beryllium-10, which fall to the surface. And by studying the quantities of these in cores, we can see when polarity reversals took place.</p> <p> <div class="quote-view quotesBlock quote_horizontal"> <div class="quotesTop"><img src="https://horizon-magazine.eu/sites/all/themes/horizon/images/quotes_top.png" alt="" title="" /></div> <p>‘The geomagnetic field has been decaying for the last 3,000 years.’</p> <blockquote><p>Dr Nicolas Thouveny, CEREGE</p></blockquote> <div class="quotesBottom"><img src="https://horizon-magazine.eu/sites/all/themes/horizon/images/quotes_bottom.png" alt="" title="" /></div> </div> </p> <p>The last reversal occurred between 772,000 and 774,000 years ago. Since then, the field has almost reversed 15 times, called an excursion, dropping in strength significantly but not quite reaching the threshold needed before rising again. This is when we are most at risk - as the field decays and then recovers its strength. The last excursion occurred 40,000 years ago, and evidence suggests we are heading in that direction again.</p> <p>‘The geomagnetic field has been losing 30 percent of its intensity in the last 3,000 years,’ said Dr Thouveny. ‘From this value, we predict it will drop to near zero in a few centuries or a millennia.’</p> <p><strong>Satellites</strong></p> <p>Today, we can already see the effects of a weakened magnetic field on our satellites in orbit.</p> <p>In the Atlantic Ocean between South America and Africa, there is a vast region of Earth’s magnetic field that is about three times weaker than the field strength at the poles.</p> <p>This is called the <a href="https://m.esa.int/Our_Activities/Observing_the_Earth/Swarm/Earth_s_magnetic_heartbeat" target="_blank" rel="noopener noreferrer">South Atlantic Anomaly</a> (SAA), and it’s the focus of the <a href="https://cordis.europa.eu/project/rcn/213916_en.html" target="_blank" rel="noopener noreferrer">CoreSat</a> project being led by Professor Chris Finlay from the Technical University of Denmark (DTU) near Copenhagen. Using data from multiple satellites, including the European Space Agency’s (ESA) three Swarm satellites launched in 2013, this project is trying to figure out what is causing the SAA.</p> <p>‘This is a region where we see that satellites consistently (experience) electronic failures,’ said Prof. Finlay. ‘And we don’t understand where this weak field region is coming from, what’s producing it, and how it might change in the future.’</p> <p><img class="@alignleft@" title="The Earth's magnetic field has been weakening over the South Atlantic (blue region). Image credit - ESA/DTU Space" src="https://horizon-media.s3-eu-west-1.amazonaws.com/s3fs-public/IMCEUpload/June_2014_magnetic_field.jpg" alt="The Earth's magnetic field has been weakening over the South Atlantic (blue region). Image credit - ESA/DTU Space" width="2300" height="1840" /></p> <p>Scientists first noticed the SAA in the 1950s, and since then it has decreased in strength by a further 6%, as well as moving closer to the west. ‘(There) hasn’t really been any convincing explanation of it,’ said Prof. Finlay, adding that scientists haven’t been able to predict how it’s going to alter.</p> <p>The CoreSat project is hoping to change all that, using the most detailed data available yet to study the properties of the magnetic field here and how it shifts over time. By probing the SAA, the team are hoping to see what’s going on inside Earth’s core that might be causing it.</p> <p>One possibility is that there could be a <a href="http://www.space.dtu.dk/english/Research/Projects/Project-descriptions/CoreSat" target="_blank" rel="noopener noreferrer">vast anticyclone</a> in the southern portion of Earth’s liquid metal outer core, which may be pushing out the magnetic field from the South Atlantic region. Another possibility is that the magnetic field in this region is pointing the wrong way – in effect, there’s a mini-polarity reversal taking place.</p> <p>The SAA gives us a direct look at how a weakened magnetic field can affect satellites, as numerous spacecraft have reported electronic malfunctions when flying over this region as they are hit by cosmic rays. But it’s unclear at the moment if the SAA has any relation to the Earth’s magnetic field flipping in polarity, which is also something Prof. Finlay and his team will investigate.</p> <p>‘In some simulations you see features like the SAA growing during a pole reversal,’ he said. ‘It’s not necessarily the case, but it wouldn’t be a surprise if something like this was involved in a magnetic reversal.’</p> <p><strong>A glimpse</strong></p> <p>Nevertheless, the SAA just might give us a glimpse of what is to come in the near future. If <a href="https://news.nationalgeographic.com/news/2004/09/earths-magnetic-field-is-fading/" target="_blank" rel="noopener noreferrer">trends continue</a>, our planet's magnetic field could reverse again in one or two millennia. Prior to that, the field may continue to weaken, and within a century we could be faced with serious problems.</p> <p>‘The decrease in geomagnetic field is much more important and dramatic than the reversal,’ said Dr Thouveny. ‘It is very important to understand if the present field will decay to zero in the next century, because we will have to prepare.’</p> <p><em>The research in this article was funded by the European Research Council. If you liked this article, please consider sharing it on social media.</em></p> <br /> <img src=”http://www.google-analytics.com/collect?v=1&tid=UA-40077089-1&cid=earth’s-magnetic-poles-could-start-to-flip-what-happens-then&t=event&ec=republish&ea=read&el=earth’s-magnetic-poles-could-start-to-flip-what-happens-then&cs=republish&cm=republish&cn=republish&cm1=1" /> This post <a href="https://horizon-magazine.eu/article/earth-s-magnetic-poles-could-start-flip-what-happens-then.html">Earth’s magnetic poles could start to flip. What happens then?</a> was originally published on <a href="https://horizon-magazine.eu/">Horizon: the EU Research &amp; Innovation magazine | European Commission</a>. By taking cores - or columns - of sediments from the sea floor, like a long straw that can extend down up to 300 metres with the help of a drill, we can look back in time and see when these reversals occurred. Dr Thouveny and his team looked at two particular forms of elements that allowed them to probe the history of our planet’s magnetic field in greater detail. The last reversal occurred between 772,000 and 774,000 years ago. Since then, the field has almost reversed 15 times, called an excursion, dropping in strength significantly but not quite reaching the threshold needed before rising again. This is when we are most at risk - as the field decays and then recovers its strength. The last excursion occurred 40,000 years ago, and evidence suggests we are heading in that direction again.